The Impeachment of Trump - What Does the Constitution Say? Impeachment is a legitimate Constitutional check-and-balance, a powerful tool to rein in corrupt politicians. 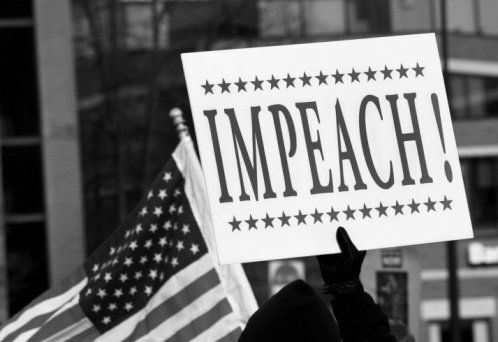 Yet it is rarely used today, so it is important to understand what encompasses an “impeachable offense” according to the contextual meaning of the framers’ specific words. We can find these meanings by exploring their definitions as written by Founding Father Noah Webster in his 1828 Dictionary, a primary source document. Following the impeachment vote, a hearing of the Senate will commence with the Chief Justice presiding. A vote will then be taken. If 2/3 or more Senators vote in favor of charges, said official will be removed from office. This “liberty power” has only been used two times against U.S. Presidents: 17th President Andrew Johnson and 42nd President Bill Clinton. In both cases the Senate acquitted. Other than that, impeachment has only been used 11 other times against federal officials, most of whom are judges. I believe this further compounds the need “We the People” have to understand the powers which protect us from certain harassing fowls in our tremendously fruitful garden of American liberties. This will give us a greater ability to hold our elected officials accountable, and insist on impeachment proceedings from our legislators wherever, whenever and towhomever they may apply.